This #PlantYourDreamBlog is a Chapter in a longer story that traces the originals of the "Winning Back Sacred Seed Starter Kit" that contains "PlantYourDream Seeds. 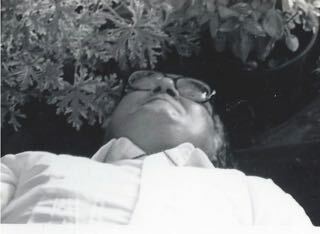 Dr Robert Muller visits the Enchanted Garden Installation at the Mandala Conference 1982. He just came in on an airplane. He was tired. I invited him to rest on a cushioned slantboard. He feel asleep. He was surrounded with aromatic plants and in the distance a woman playing a harp. He awoke. "Where am I?" he asked. "You are in the Enchanted Garden," I said. "From a deep place in his lungs, Robert Muller said to me, "Let Us make our entire, miraculous planet into an Enchanted Garden!" In 1982, I was at an international gathering in San Diego California destined to advance healthcare in the direction of a more wisdom-based model that would include body, mind, and spirit. I was standing among an array of plants and natural elements in an exhibit that we created-- my first Enchanted Garden installation at a conference. The Assistant Undersecretary General of the United Nations, Robert Muller, came to that event to present its organizer with a UN Peace Medal. When it was time to leave the conference, Muller came into the Enchanted Garden environment that a team of us had co-created on the cement floor covered by a thin hotel rug. It was a large room that we had transformed, around 100 by 200 feet. He was followed by the Press. He had no time to give them a story. He had to catch a plane. He passed my way. He told them that if they wanted a story to interview me. Then, without speaking, he reached over and pressed something in my hand. Moments later I was all alone. I opened my hand and found a United Nation's Peace Medal, identical to the one he had given on stage. I didn't know what to make of this gift. He returned to the conference a year later. I had a chance to ask him about that medal he gave me. I asked if he gave a lot of those medals out. He said, "No, I give them out rarely." I asked him why he gave me that medal. He was known in his day as a visionary and prophet. He told me, "I gave it to you, not so much for what you have done in your life, but for what you will do with your life,"
The work I do today these 34 years later, is the fulfillment of that work. Through a brief ritual, I alert each person that there is great inspiration and benefit to Plant Your Dream. Doing so has the potential to return our cemented world into an Enchanted Garden once again. It's a profound experience when we are seen. Oftentimes when I see you, I ask about the dream over your head that's asking to be planted. It is a tremendous honor to engage at this level, about the dreams we each have. I am seeking to empower each person to connect their consciousness and healing potential with ancient seeds. It is good to be reminded that through the Plant Your Dream ritual, we can witness the growth not only of blades of grass, but of a possible future. I say, "Plant a seed. Grow a whole new world." I live within a garden of consciousness that has been planted by pioneers who want the best for humanity. I carry forward the unbroken flow of that stream through my work. I am not alone in carrying forward my message. I've been blessed to know many pioneers who live in this garden. I am blessed to encourage you and to recognize that it is you who are making a beautiful world. This is a photo of the UN Peace Medal I was given. The UN Peace Medal has a chaff of wheat around it. Also in the photo is wheat I have grown, kernels of ancient wheat. I received the medal in 1983 or so. I never knew I would be growing wheat at the time. How prophetic. 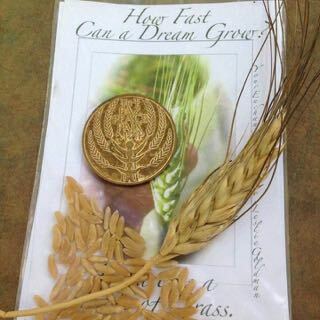 Thanks to KAMUT International & Baker Creek Heirloom Seed Company, for helping produce "The Winning Back Sacred Seeds Starter Kit" with Plant Your Dream Seeds. The Kit is a seed packet containing Ancient Wheat. This #PlantYourDreamBlog series shares how I use the seeds in this packet to help you Plant Your Dream. It reviews some of the ceremonies and conferences where the seed packet was used in 2016. 4000 packets were given away in 2015-2016. The seed packet has helped spread the word about the National Heirloom Expo, an important event that gathers gardeners and farmers from around the USA, and educates about our original seeds, called heirloom seeds. The next National Heirloom Expo is September 5-7, 2017. The seed packets will also be used throughout the year of 2017, both in one-on-one rituals and in group ceremonies. I am creating an Opening NYE Ceremony December 31, 2016 at San Diego's Worldbeat Cultural Center. I will give away #PlantyourDream Seeds. I recommend using heirloom seeds or be in touch and we can arrange to get the official Winning Back Sacred Seed Starter Kit. Nature gives us a multitude of living metaphors that are easily accessible and demonstrate Soul principles. Grow the Ancient Grass! You will discover your very own Metaphoric Mind!